Chickens don’t ordinarily need bathing. They maintain their personal hygiene by dust-bathing, which essentially involves rolling in dirt. At the end of a dust bath, the dirt is shaken off and the chicken proceeds to preen and groom its feathers back into place. However, there are times when an especially filthy fowl will need a bath, and when it does, don’t overthink it. Bathing a chicken is a lot like bathing an infant or a dog: The most important thing is to prevent drowning while accomplishing the task with reasonable speed. 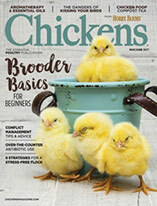 Note: This article will cover the basics of bathing backyard chickens, not show chickens preparing for a poultry competition. When I give my dog a bath, she gets the head-to-toe treatment, but chickens can be spot-bathed more often than not. For example, if the vent feathers are filthy, I only wash that area. 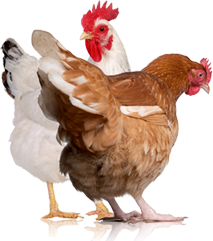 Chickens spend a great deal of time arranging and conditioning their feathers with oil from their uropygial gland, aka preen gland or oil gland. Feathers are better left unstripped of these natural oils if possible. However, in some cases, a summer bath is a necessity. Before you get started, you’ll need the following supplies. I like to bathe my chickens in a bathtub or a sink with a sprayer nozzle, but two large basins or buckets will do: one for washing and one for rinsing. Before adding any water, add a strip of rubber shelf liner to the bottom of the tub or bucket to prevent slipping. Then run lukewarm water into the container. Holding the bird securely with one hand on the wings at all times, slowly place it into the tub. 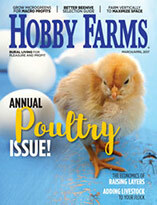 This is not a natural or welcome activity for a chicken, and there will initially be some flapping. If dried droppings or raw egg are stuck to the feathers, allow the bird to soak for awhile before attempting to clean the feathers.Using a sprayer nozzle or cup, soak the dirty areas well. Apply a small amount of baby shampoo to the feathers and skin, and lather it up. When washing a chicken’s feet, particularly when treating a foot injury or bumblefoot infection, a nail brush can be helpful in removing dirt from toenails’ intact areas of skin. When you’re finished with the wash, rinse well with clear water. Then gently squeeze excess water from feathers, and wrap the bird securely in a large towel. If the weather is very warm, the chicken can air-dry; otherwise, dry the bird with a hair dryer on low heat. Leave the wet bird partially wrapped in a towel with its wings loosely secured to its back while turning on the hair dryer. The sound of the hair dryer may be startling initially, but chickens quickly adjust to the noise and sensation. Always keep one hand near the dryer airflow to be certain the temperature isn’t too warm. Working one area at a time, fluff the feathers gently while directing the airflow at the target area until dry. As you can see in the photo above, the hen, which is being treated for a prolapsed uterus during cold weather, is standing on my leg voluntarily with no restraint. She enjoyed her first bath and blow dry quite a bit! Following a skunk-encounter post on Facebook, Shelly Wade shared this recipe for a de-skunking shampoo, safe for chickens, dogs and other farm animals. NOTE: Shampoo should be mixed prior to each use and never mixed and stored. Shampoo can be drying to the skin and may require follow-up with a leave-in conditioner. This solution may bleach fur or feathers. Mix the hydrogen peroxide, baking soda, dish detergent and warm water until the baking soda and detergent are dissolved. Work this solution into the chicken’s skin and feathers for at least five minutes. Rinse thoroughly with water. Repeat if necessary. Follow up by applying the de-skunking solution, but do not rinse it. Never leave your bird in the sink, tub or bucket unattended. It’s an accident waiting to happen, which could have dire consequences. Don’t use harsh detergents or vinegar (except for a de-skunking bath), which can strip the oil off feathers, dry the skin and make feathers brittle. Don’t pull off dried poop from the feathers; this can pull away more than just debris, such as bits of feather and possibly even skin. Plan on getting wet. An apron may be in order. Keep the water a comfortable, lukewarm temperature. Hold onto the wings gently to discourage flapping and escape attempts. Keep the bird’s head above water at all times. Expect extreme relaxation before long; many chickens enjoy baths so much that they fall asleep. Consider rubber gloves if poop is involved. Bleach the tub or bucket and thoroughly rinse it when you’re finished. While your bird won’t be ready to walk the runway at the county fair or win a sanctioned poultry show, a nice bath given only when absolutely necessary will help keep your birds looking fresh. Most birds love it in the end, and it’ll make you feel better about your birds.